Reformed Fatty! : What time is it?!?! 10 minute Amrap of "DT"
Thoughts: This is not a light weight for me, but it is a weight I can handle. It's amazing to think that last year at this time I could only dream of cleaning this weight, not it is something I can handle easily (for 1 rep). Luckily it will not be too hot tomorrow so sweat will not be a huge problem grip wise, but regardless of that fact, I will bring with me a rosin bag and maybe even some gloves to test out. The shoulder to overhead will really tax me. I am hoping to get through one complete round unbroken then breaking it up as necessary. In order to save some grip, I think I will do 11 deadlifts with the alternating grip before switching on the 12th to the hook grip so I can move on to the cleans quickly. Goal: I'd like to get 3 complete rounds in...hoping that I feel good and am able to get 3+ in. 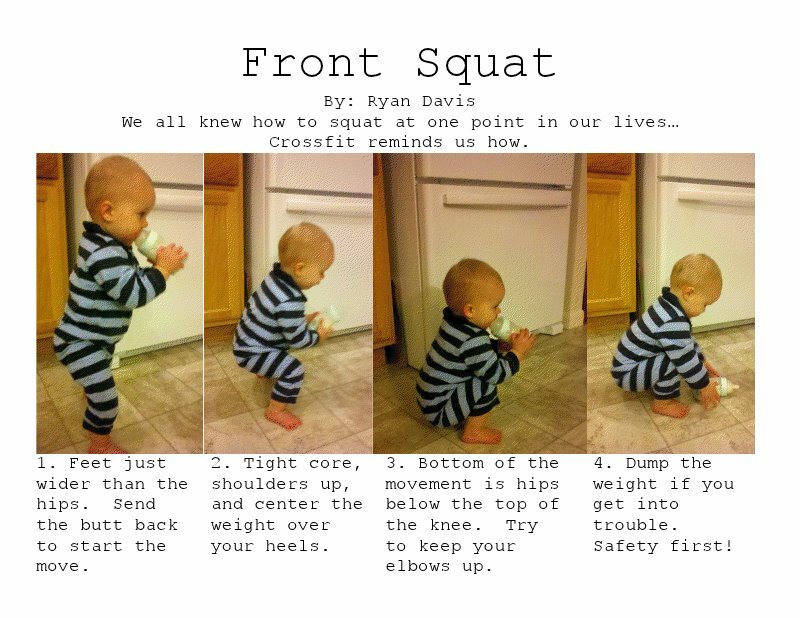 Babies can do it...why can't I?!?!?! Thoughts: Ew. Front Squats are my nemesis. I am terrible at them. My 1rm is something like 205 so 185 is a HEAVY weight for me to do an AMRAP of. Beyond that, I have trouble with my depth so getting no-repped is a real concern. Last week we did 5x5 front squats for strength and I got to 175 and failed on my 4th rep. This is something I just have to grit my teeth and fight through. On top of the front squat, because this competition is outside, you have to clean the bar up. 185 is a heavy weight for me to clean. Again, I can do it but when I'm tired will I be able to do it late in the round? to be seen. My strategy is to try and not kill myself with the front squats and make up as much as I can with sit-ups and burpees. This is the one event that scares me. 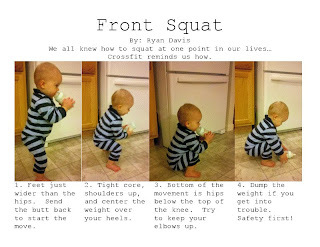 Goal: If I can get 10 on the front squat I'm psyched. I have to try and squat clean the bar up so I don't waste energy. I am thinking something on the order of 40ish on the sit-ups and hoping for 16-20 on the burpees (you have to jump onto a 45lb weight so that is why I'm not looking at 22-25). 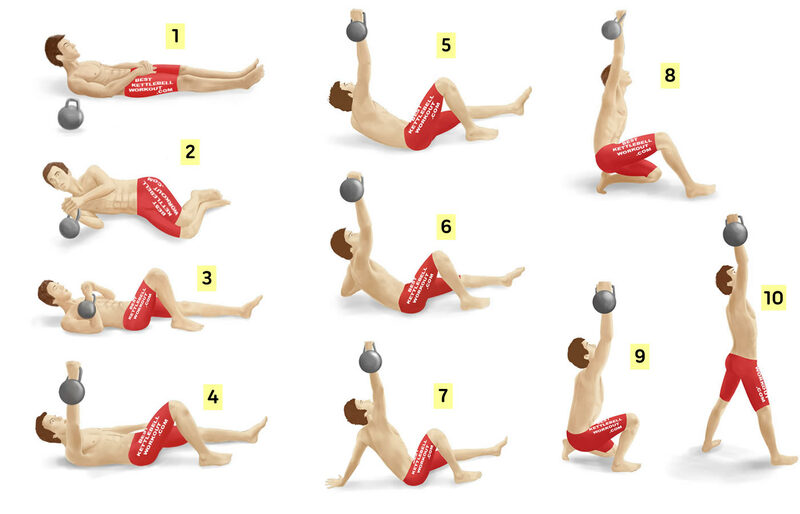 This is a turkish get up. I have to do it with a 72 lb kettle bell. Thoughts: I really hope I start on the TGU so I can do rowing last. The difference between first and last in the turkish get-up would be no more than about 3 reps. It is a slow movement so why kill yourself on it when you can save yourself for the box jump? This one is really going to make me winded. Also, I've never done a turkish get up with 2 pood, it should be interesting to say the least...hope my arm doesn't snap! Goals: I don't know what number to put to this but I hope I can get about 15 Box-jumps each round and at least 2 TGU's. We'll see though! Regardless of my placing at the end of the competition, it will be fun! There are a lot of ex-610ers competing or coming to support the competitors. Can't wait!